This is the deluxe version of a homemade present! 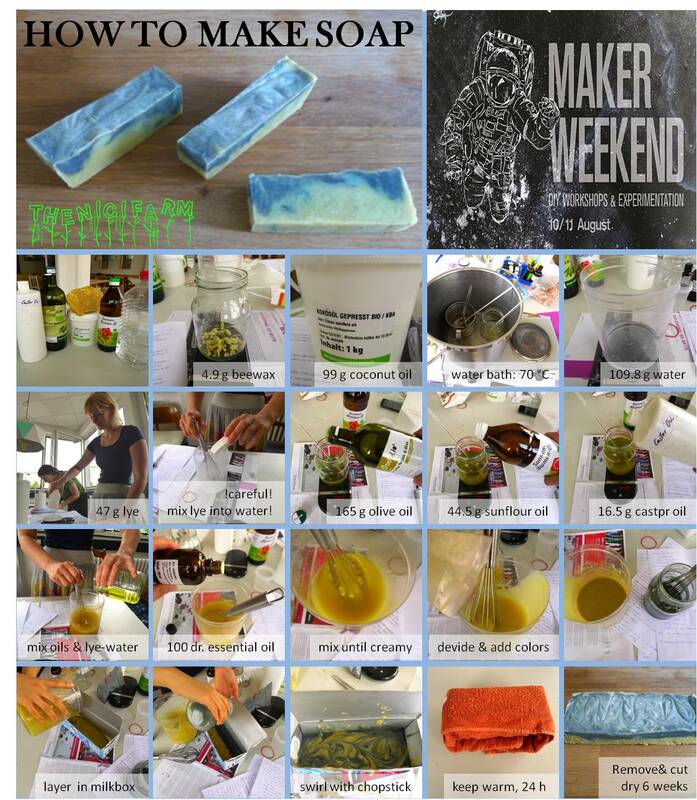 At a wonderful workshop at betahaus in Berlin I learned how to make soap from scratch from luna. It is easy and lots of fun! This recipe contains a perfectly balanced mixture of cleaning and moisturizing oils. If you want to use different oils we should get together to calculate a different mixture because this is a little bit trickier. To get started I would start off by sticking to this recipe. It will take about 3 hours. Put jam glass in a simmering water bath (double boiler) and heat and stir until beeswax has melted. Temperature should be at about 70 °C, control with a candy thermometer. Let cool. On a piece of paper weigh 47 g lye (NaOH), !careful, corrosive! Close to an open window carefully and slowly mix LYE INO WATER in 3 portions while stirring. Let cool for 15 minutes in front of an open window. Pour oil mixture into lye-water. Now we have to be fast…Mix with a whisk fast until the consistence is creamier like liquid honey cream honey. This is your soap mixture. Quickly add 150 drops of essential oils and keep mixing. Mix until soap mixture gets creamy as pudding. This will happen in a few minutes. Divide soap mixture into portions and quickly add colors, mix. Cover lid and pack into the towel to keep warm for 24 hours. In this time the soap is saponifing. After 24 hours cut soap into pieces and let dry on a cool dry place for 6 weeks. In this time the pH of the soap will (drop) get milder and you can use it to wash your hands and body. THAT’S IT!! Congratulations you made your first soap!